Finance Minister Bill Morneau says 50 Canadian companies have so far been exempted from paying surtaxes on U.S. steel and aluminum imports that have been in place since Ottawa imposed retaliatory tariffs last summer. The federal government has so far exempted 50 Canadian companies from surtaxes imposed last summer when Ottawa slapped retaliatory tariffs on U.S. steel and aluminum imports, Finance Minister Bill Morneau said Tuesday as he faced pointed questions about his relief plan from political opponents. 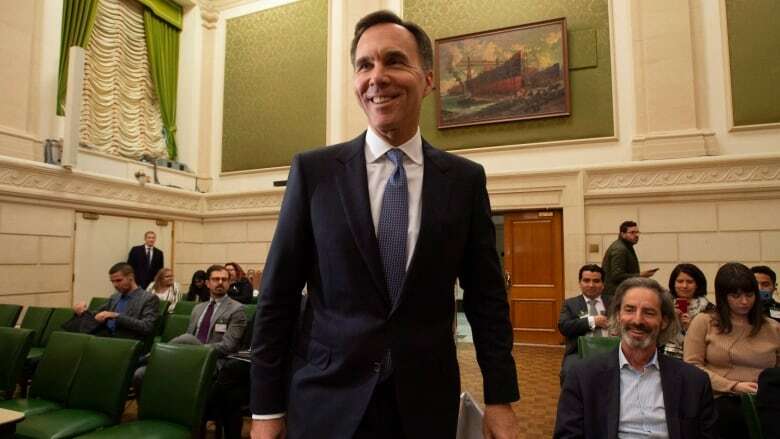 Morneau provided the figure before a parliamentary committee, where opposition MPs accused the government of being too slow in helping Canadian firms affected by the cross-border tariff fight. Members of the international trade committee also said Ottawa's remission request process has been too onerous for many companies, particularly smaller ones already consumed by the day-to-day activities of running their businesses. "You said in your statement that we're doing everything possible, but I have to be frank that we've heard quite the opposite here," said New Democrat MP Tracey Ramsey. "From the witnesses at this committee, we've heard of the dire consequences of these tariffs and the government's failure to get that support directly to people on the ground. Businesses are talking about laying off people." Conservative MP Dean Allison said he's heard from many businesses caught in the crossfire that are worried the financial relief isn't arriving quickly enough. "I can assure you that that money cannot get out the door soon enough in order to keep these companies viable over the long term," Allison told Morneau. The finance minister, who said 135 companies have submitted remission requests, agreed he would like to see the relief money flow faster — but he stressed there's a process that must be followed. "This is pretty unprecedented. We aren't in a situation where there's a play book," Morneau said. "And we certainly hope it goes away quickly." In July, Ottawa applied retaliatory tariffs on $16.6-billion worth of U.S. imports of steel, aluminum and other products. The federal government has said it had no choice but to hit back at the U.S. with the countermeasures. It also announced a financial aid package for industries caught in the middle of the dispute, including up to $2 billion in new funding and support for workers in steel, aluminum and manufacturing sectors. During his appearance Tuesday, Morneau provided an update on another category of support provided via the aid package, which involves the Business Development Bank of Canada and Export Development Canada. So far, he said BDC has authorized loans totalling $131 million for 189 businesses, while EDC has authorized $44 million worth of loans for 24 clients. Morneau noted that firms approved for remission will also be eligible for refunds on duties they've already paid in the months since Ottawa imposed the counter-tariffs. He was asked how much extra revenue the surtaxes have already brought in, but he declined to provide a number and only said the duties were generating "significant" revenues. The tariff dispute has dragged on even though the Liberal government reached a new continental trade agreement this month with Washington and Mexico City. The Trump administration has maintained its stinging levies on Canadian steel and aluminum. Morneau said the government is still negotiating with U.S. officials in hopes of seeing the duties lifted. Committee member and fellow Liberal MP Peter Fonseca asked Morneau whether the government was considering a quota system as part of the potential solution to the tariff dispute. "We're really not going to negotiate in public in terms of the actual approach that we're trying to take," said Morneau, adding he wants to make sure the market is stable and that the Canadian steel industry and users of steel are unharmed. "Clearly, we want to move away from the current situation. So, the mechanism to do that? We're not at a stage where we're able to talking about that because it's not close to being done."